Seriously, James took a picture of the back of my cycle. 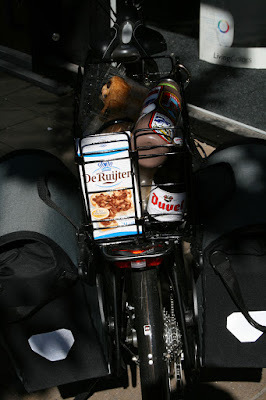 And while we were in Delft's center square, a tourist took a picture of the back of my cycle. Odd? Well, the basket on the back of my bike holds our snacks and lunches, spare beverages and leftover pastries. And this particular time we had leftover chocolate sprinkles and a Duval (great Belgium beer---my current favorite). And it occurred to me, when peeking at my basket, that it represented some favorite Holland foods: beer and chocolate. More importantly: good beer, and chocolate made to sprinkle on bread. It just fit. 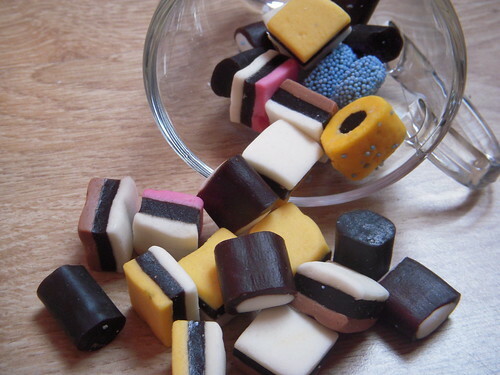 I probably just needed to add some herring and stroopwafels and cheese... and a few Drops (those black licorice tasting candies---yep, tried them too, the salty variety? One after another, and in varying degrees of enthusiasm, each family member unloaded our 'tastes' into the garbage). I didn't mind the chewy variety so much---they aren't as salty. We did finally try herring, just so you know. 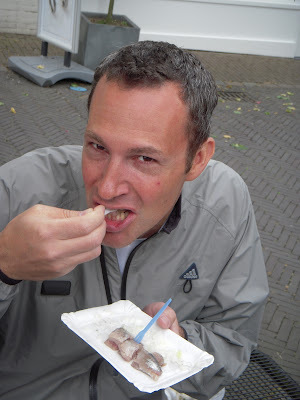 It is classic, and stands are everywhere and there is always a line of Dutch waiting for their herring treat. Honestly, I wish I loved it too. It would be far more authentic than swallowing an omega 3 pill: herring are a brilliant source of Omega 3. But I digress. We tried it, but didn't love it. James - just letting you know I'm following along with your blog posts! I first learned about Duvel back when I worked at Cisco. My manager, Bart, was based in Belgium, and after a team offsite to Belgium all the internal servers started getting nick-named after local beers. I typically worked the "duvel" server :) Hope we have a chance to say Hi in person when we're in Italy in October. Holy cow Janelle! I haven't been by in such a long time, and when I finally "drop in" to see how things are going- I find the adventure of a lifetime! I will be checking in often and cheering you on! What a marvelous adventure- and what a great way to spend time with your precious boys! Oh, and those chocolate sprinkles look like heaven. It's your cousin Lucy. Great reading these posts! Just FYI, Duvel is basically my husband Nick's favorite beer, and his father was born in Belgium. So I feel the connection. Also, I hope you heard from Mary Lovrien by now -- she and Tab are in the process of moving TO Belgium right now and I urged her to get in touch with you. Will you be checking your personal email now & then? PS -- I was not sure of these choices for my comment as "profile" -- don't know what they all mean, but I hope this anonymous one works.